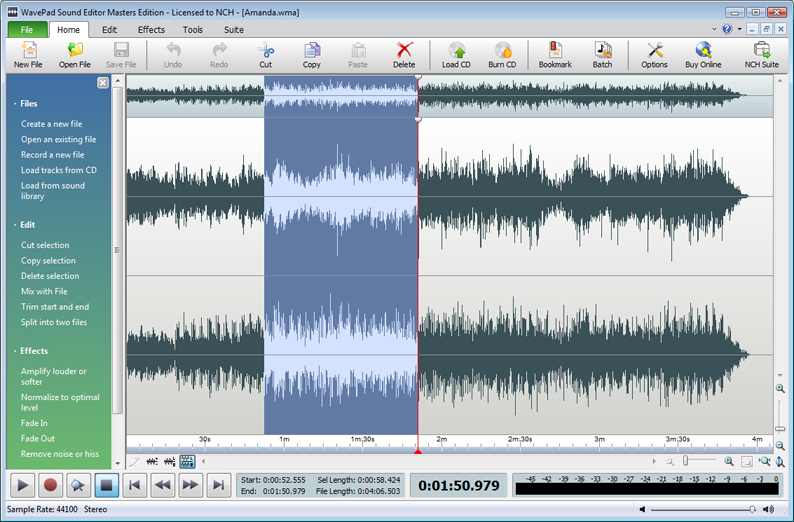 WavePad is music editing program for the Windows OS. WavePad allows you to create and edit voice music and other sound recordings. You can duplicate sections of recordings and add echo amplification noise reduction and other effects. The following is a list of features for WavePad Music Editor. We recommend you download and install the software to give these features a try. The download is free. * Recorder supports autotrim and voice activated recording* Music editing functions include cut copy paste delete insert silence autotrim and more* Music restoration features including noise reduction and click pop removal* Special effects include reduce vocals distortion chorus and more* Batch processing allows you to apply effects andor convert your files as a single function* Supports sample rates from 6000 to 96000Hz stereo or mono 8 16 24 or 32 bits* Pre-defined sound quality suggestions when saving files such as CD Quality and Radio Quality* Advanced tools include sound spectral analysis (FFT)* Load sound files directly from CD* Ability to work with multiple files at the same time in seperate screensAbout NCH Software:NCH Software is a leader in video dictation audio business and computer utility software for Windows and Mac. NCH Software has over 80 products and has been developing them since 1993. NCH has received several awards for excellent software.